Hundreds of passengers have been left stranded after the Hong Kong airline Oasis stopped flying and applied to go into liquidation. Oasis first flew in October 2006, offering flights from London Gatwick to Hong Kong for as little as 1,000 Hong Kong dollars (£65) each way. It later added flights from Hong Kong to Vancouver. KPMG, appointed as liquidator, advised ticket holders to call 00852 3628 0628 or 0844 482 2323 for more information. Oasis operated daily flights between London and Hong Kong and six services a week between Hong Kong and Vancouver. "There are hundreds of people stranded, including children returning after the Easter school holidays," said a Cathay Pacific spokeswoman. Oasis chief executive Stephen Miller held a news conference to announce the shutdown but did not give any details of why it had happened. The Hong Kong Economic Times reported that the airline was struggling with debts of up to one billion Hong Kong dollars ($128m). Soaring fuel bills have forced other airlines out of business recently, including the Hawaiian airline Aloha and the business class airline Maxjet. 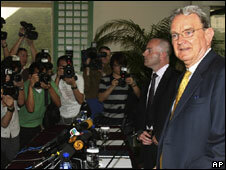 Operations and safety editor of Flight International magazine, David Learmount, said that he was not surprised by the news. "Given the economic climate that exists, Oasis was always going to struggle to succeed. "If you look at all the budget airlines, they are all operating either domestically within their own country or within Europe. Europe has had completely open skies for years now, so flying within Europe is really like flying domestically. "Airlines can complete comparatively-short flights and turn their aircraft round quickly and they are not subject to rules and regulations that govern aviation in other parts of the world." Fellow Hong Kong airline Cathay Pacific is offering specially priced one-way flights for stranded Oasis passengers and is scheduling extra flights. But one traveller booked to fly with Oasis to Hong Kong on Saturday said they have had to make their own alternative arrangements. "We have had to pay out for new flights without knowing for definite that we will be refunded for our old ones," Alice, from Darlington, told the BBC News website. "I simply cannot believe that Oasis did not put any extra measures in place to help out people like us with only a few days to go to our holiday," she said. Oasis was launched 18 months ago by husband-and-wife team Raymond and Priscilla Lee and employs almost 700 staff. The Hong Kong government has stepped in to co-ordinate measures to help stranded passengers and is sending staff to assist at London and Vancouver airports. 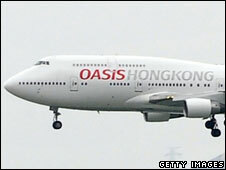 The final Oasis flight arrived in Hong Kong from London at about 0700 GMT on Wednesday. Will there be 99p flights to New York?